A security researcher on New Year's eve made public the details of an unpatched security vulnerability in Apple's macOS operating system that can be exploited to take complete control of a system. 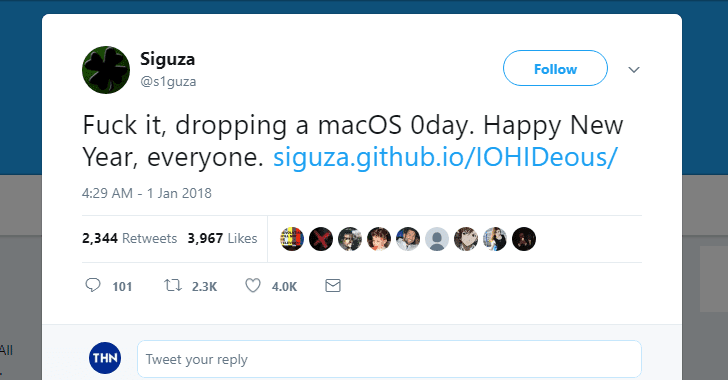 On the first day of 2018, a researcher using the online moniker Siguza released the details of the unpatched zero-day macOS vulnerability, which he suggests is at least 15 years old, and proof-of-concept (PoC) exploit code on GitHub. The bug is a serious local privilege escalation (LPE) vulnerability that could enable an unprivileged user (attacker) to gain root access on the targeted system and execute malicious code. Malware designed to exploit this flaw could fully install itself deep within the system. "IOHIDFamily has been notorious in the past for the many race conditions it contained, which ultimately lead to large parts of it being rewritten to make use of command gates, as well as large parts being locked down by means of entitlements," the researcher explains. "I was originally looking through its source in the hope of finding a low-hanging fruit that would let me compromise an iOS kernel, but what I didn’t know it then is that some parts of IOHIDFamily exist only on macOS - specifically IOHIDSystem, which contains the vulnerability." The exploit created by Siguza, which he dubbed IOHIDeous, affects all versions of macOS and enables arbitrary read/write bug in the kernel. Besides this, IOHIDeous also disables the System Integrity Protection (SIP) and Apple Mobile File Integrity (AMFI) security features that offer protection against malware. The PoC code made available by Siguza has for some reason stopped working on macOS High Sierra 10.13.2 and works on macOS High Sierra 10.13.1 and earlier, but he believes the exploit code can be tweaked to work on the latest version as well. However, the researcher pointed out that for his exploit to work, it needs to force a log out of the logged-in user, but this can be done by making the exploit work when the targeted machine is manually shut down or rebooted. Since the vulnerability only affects macOS and is not remotely exploitable, the researcher decided to dumped his findings online instead of reporting it to Apple. For those unaware, Apple's bug bounty program does not cover macOS bugs. For in-depth technical details about the vulnerability, you can head on to researcher's write-up on GitHub.